There is nothing quite like the big lacy pouf balls that adorn a Hills-of-Snow hydrangea bush in July. "Anabelle" is a somewhat compact variety of Hills-of-Snow, although mine grows quite large. I did this painting with only two colors: yellow and blue which I mixed to make various shades of green. The white areas, as is the case with watercolors, is merely the white of the paper which is unpainted. This combination captures the sunlight and shadows on the flowers quite well, don't you think? 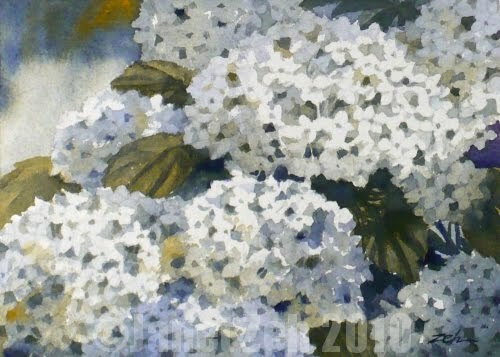 Find my original paintings and prints in my shop at JanetZeh.Etsy.com. Thanks for stopping by and have a beautiful day! Oh this is beautifully done Janet! What patience you have! Beautiful tonal value between the flowers. Thanks Maree! I was very pleased with how it turned out and I appreciate your comment.